Last Week in Review: Job growth held steady, unemployment dropped and GDP jumped. Forecast for the Week: A few reports fill the space leading up to the December Federal Open Market Committee meeting. View: The IRS issued a new tax scam alert regarding the Affordable Care Act. “Get a good job with more pay and you’re OK.” Pink Floyd. Job growth held steady in November while economic activity surged third quarter. 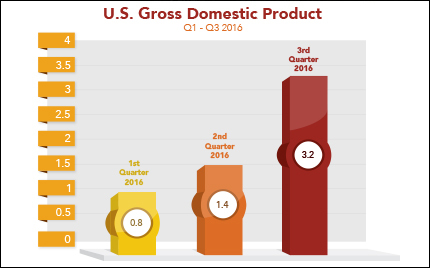 Consumer spending and business investment pushed Gross Domestic Product (GDP) above expectations in the third quarter. After weak economic growth the first half of 2016, the Bureau of Economic Analysis reported that the second reading of third quarter GDP surged ahead by 3.2 percent, the fastest pace in two years. GDP is the monetary value of all finished goods and services produced within a country’s borders in a specific time period, and it is considered the broadest measure of economic activity. Consumer spending rose by 2.8 percent while business investment rose sharply by 10.1 percent. Job growth held steady in November. The Bureau of Labor Statistics reported that U.S. employers added 178,000 new jobs in November, near the expected 180,000. That brings the monthly average to 181,000 in 2016. Within the report it showed that average hourly earnings fell by 0.1 percent, while the unemployment rate fell to 4.6 percent, the lowest level since August 2007. The low unemployment rate, however, is due in part to some unemployed Americans dropping out of the workforce. Personal incomes also rose 0.6 percent in October, the best monthly gain since April, while personal spending was up 0.3 percent, below the 0.5 percent expected. The pickup in income is good for consumers and the economy; however, it can lead to higher inflation if the trend continues. For now, the inflation gauge Core Personal Consumption Expenditures (which removes volatile food and energy prices) remained tame in October, rising 0.1 percent from September, in line with estimates. The year-over-year rate was unchanged at 1.7 percent. When inflation rises, it can hurt the value of fixed investments like Mortgage Bonds, to which home loan rates are tied. This means higher inflation can also cause home loan rates to rise. Although home loan rates hit their highest 2016 levels at the close of November, rates are still historically low. Only a few reports remain in the lead up to the Federal Open Market Committee meeting December 13-14. ISM Services Index will be released on Monday. On Tuesday, third quarter Productivity will be delivered. Closing out the week, the Consumer Sentiment Index will be released on Friday. As you can see in the chart below, Mortgage Bonds gained some traction in recent days after significant losses the last few weeks. Fake notices designed to look like actual IRS CP2000 notices (sent when information received about your income doesn’t match your tax return) will claim you owe money for the previous tax year under the Affordable Care Act. Emailed notices are a red flag because the IRS doesn’t initiate communication by email. These emails may include a link to make an online payment. Fake payment processing websites can not only defraud you but also steal your identity or infect your computer. If you or anyone you know receives a suspicious notice, a copy should be immediately sent to phishing@irs.gov and then deleted from your email account. The Federal Trade Commission should also be notified.